One of the recurring themes in my articles is patience. There are hundreds of hard hitters in the sport of mixed martial arts, but the factor that so often separates the dangerous brawler from the accomplished knockout artist is the recognition of opportunity. Of course, there are times where you can't wait for the perfect opportunity. If a fighter is quite clearly losing a fight with two minutes left on the clock, there isn't much point in waiting because the opponent is going to sit on that lead and not get hurt. For the most part, though, everyone can benefit from learning a little patience. Nowhere is this more apparent than in the career of the "Super Samoan" Mark Hunt. Formerly a bum-rushing kickboxer who got by on his speed, power, and legendary jawline, Hunt is now a methodical counter-striker with hugely improved defence and ring craft. Hunt burst onto the kickboxing scene with an underdeveloped skillset but quickly went about beating men who had fought professionally for years. Hunt's kickboxing career comprised 43 fights against mixed competition, with some wins over big names, and took place in just four years! Now, to say his skillset was underdeveloped is fair--he lacked the ability to deal with the sharper boxers and kickboxers who weren't overwhelmed by his power--but that is not to say that Hunt was stupid. In fact Hunt was pretty good at making strategic changes to pick up wins. Famously he dropped his hands against Jerome Le Banner and Ray Sefo simply to draw them into brawls because he was getting picked apart. Hunt also showed, even from his earliest days, an understanding of how an opponent's movement related to his own punch selection and power. For instance, Hunt understood that he had to get his opponent bending forward to maximize the impact of his frightening uppercut. It was ugly but effective; he'd rush in and try to pull his opponent's head down for the uppercut or use a blocked left hook to hunch his opponent over just a little. Here he is against Peter Graham, in their first bout, charging for Graham and grazing an uppercut. Moments later he was able to find his mark and the bout was over. Aggressive uppercutters tend to miss a lot--just look at Rocky Marciano--but when an uppercut connects it is easily one of the most dangerous punches in the boxing arsenal because it comes straight through the blind angle below an opponent's vision. Hunt also understood that if an opponent was running away from his right hand, he was adding force to a collision with Hunt's left. Sounds simple, right? But you wouldn't believe how many fighters don't make use of this. As Stefan Leko, a very respectable kickboxer, moved away from Hunt's numbing right hand, Hunt caught him with a short left that ended their bout. For the most part, though, Hunt was a rusher. He would use a one-two to get in close and then swarm with punches. This made him very easy to hit. Notice here how Hunt's unbridled aggression runs him straight onto Jerome Le Banner's short southpaw right hook. It's commonly assumed that Hunt's late-career turnaround inside the UFC has been due to his improved grappling skills, which have allowed him the chance to survive long enough to do his job on the feet. I would suggest, however, that Hunt's newfound success has almost as much to do with his learning to fight on the counter, rather than treating each moment of the fight as another chance to bull rush. One major improvement that has enabled this change of strategy is Hunt's polished left hook. While I pointed out his nice left hook as Stefan Leko circled away above, Hunt was more often than not an overwhelmingly right-handed puncher in his K-1 days, willing to chase with his power hand even when the opponent was moving away from it. In the UFC, though, Hunt has been sitting back and waiting for opponents to lunge at him through the path of his left hook. When they make their move at him, he drops the bomb. Nowhere was this more obvious than in his fight against Cheick Kongo. Kongo attempted to distract Hunt with a switch step into a right hand lead. In terms of form he did everything right--his punching shoulder was high and covering his jaw line-but that didn't stop Hunt from finding Kongo's temple as the Frenchman retracted his punch. This counter left hook has proven to be a nightmare even for the better strikers of the UFC heavyweight division. The story of the opening minutes of the Hunt–Dos Santos bout was one of Dos Santos attempting to lunge in with his strikes and getting clipped with a left hook each time he did so. Eventually Dos Santos managed to get his head movement and timing down, bringing the right hand over the top of Hunt's left hook in turn, but the bout was one of constant adjustment by both men. Here is another beautiful instance of the left hook being used on the counter. This time Hunt parries Stefan Struve's jab and moves through the space behind the punch. The parry into the left hook is a fantastic way to close the distance against a much taller opponent. If that clip of Hunt versus Stefan Leko showed us one thing, it's that if you walk into a fighter's punching power it's going to hurt much more than if you're standing still or moving away from it. Striking is about creating collisions rather than chasing. Something all the best punchers eventually learn is to herd their opponent into power punches. This means pressuring an opponent back towards the ropes or fence until he chooses a side to circle to, then meeting him with a blow from that side so that he runs into the power of the blow, creating a collision. Here's a nice example of Hunt backing Stefan Struve onto the fence, pausing momentarily to allow Struve to think about firing back, and immediately hammering the big Dutchman with a left hook. This technique is so effective because the vast majority of fighters are trained to circle out towards their opponent's weaker, lead side. Junior dos Santos has a long history of backing up into the fence and attempting to circle out with his hands low, and both Mark Hunt and Cain Velasquez had great success hitting him with a left hook in this scenario. The way in which Hunt now carries his lead hand, far lower than he could afford to against world-class kickboxers, not only allows him to get an easy underhook against an opponent's takedown attempts, but also hides his intentions when he intends to lead. His lead left hook has proven pretty effective in recent years in setting up both his right uppercut and his right straight. Here he drops Chris Tuchscherer. The cross counter is easily the most dangerous counter punch in the boxing arsenal. This technique was around in the days of antiquity--appearing in just about every technical manual up until the 1950s--and remains the most effective method for knocking a fighter out to this day. A cross counter is any right-handed punch (combined with a slip to the inside) that arcs across the top of an opponent's left jab. Hence, cross counter. A cross counter may be an overhand punch, an arcing punch, or a straighter punch. The important point is that it travels over the opponent's jab just as they are committing to their strike and their own lead shoulder is blinding them to the counter. 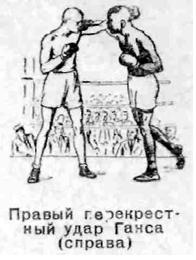 Here is K. V. Gradapolov's illustration of “The Old Master” Joe Gans demonstrating the cross counter in Tactics of the Foreign Masters. Mark Hunt has found incredible success in the UFC by sitting back and waiting for his opponents to poke at him with the jab. A great many fighters lack an authoritative or intelligent jab and will simply stick it out when they are confused or too timid to step in and throw. Hunt thrives on this. Here is Chris Tuchscherer driving in with a jab and eating Hunt's right hand over the top. Hunt's finest cross counters came against Stefan Struve. If anyone fits the description I just gave about fighters simply jabbing because they are told to, it is Stefan Struve. The seven-foot Dutchman has a tendency to fight like someone half his height, and when he does jab it lacks set-up, feints, or science. He simply pokes it out there and hopes for the best. Hunt was, of course, having none of that. Here Hunt attempts to land a cross counter over the jab, doesn't quite get the connection, but comes up with a left hook. The cross counter really was the game changer in that fight, however. Just before Hunt dropped Struve for the finish, he wobbled the legs of the giant with a cross counter. Backing away in order to lure Struve in, Hunt capitalized on Struve's jab masterfully. 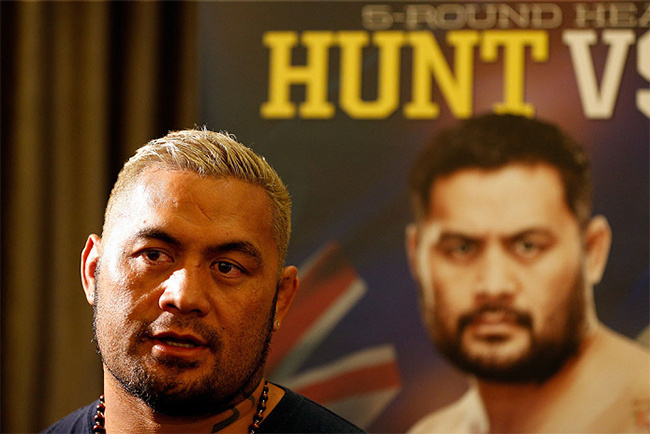 Mark Hunt has certainly come a long way since his days in K-1 and his MMA debut in PRIDE FC. We're no longer looking at a man who needs a brawl to win but a man who will sit back and allow his opponents to come to him, threatening them with leads only if they refuse to engage. His ring craft has improved tremendously. Where he used to run forward and backwards and get stuck in corners repeatedly in K-1, he now uses his own considerable presence to impose upon the other man and back him into the fence. Hunt learning to herd his opponents into his power punches after years of simply swinging is not dissimilar to the strategic rebirth George Foreman underwent during his comeback. God-given punching power and grit can hold a fighter back. Such talents turn fighters into wild men. There is a pressure to get close and convince opponents to trade blows, a tendency to eat two to land one. If one of these gifted punchers stays around long enough, though, as Mark Hunt has and George Foreman did, you will see their attitude mature. They will place a greater value on their health, their defence, and their positioning. They learn not to waste energy running after people, but rather to cut off the ring. Of course for every Mark Hunt or George Foreman, picking up the technical skills as they age, there are a dozen Wanderlei Silvas: guys who never move away from that self-sacrificing style of brawling. But that just makes the career rebirths of those few special fighters all the more exciting. Mark Hunt meets the gigantic Antonio “Bigfoot” Silva tonight at UFC Fight Night 33 and it will be interesting to see how Hunt carries himself against an opponent who has struggled so much in the past with his opponents' hand speed.